New York’s new 9/11 museum is a masterpiece. It is the first big thing built to mark that day that is fully worthy of it. It also struck me as a departure from a growing style among those who create and tend historic sites. That style involves the banishment of meaning—of the particular, of the real and tangible, even to some degree of the human. The plaques on landmarked buildings often tell us of the architectural school under which the edifice was created, but little of the great man or woman born there. A few weeks ago, during a visit to the occasional residence of a former American president, a museum official noted with pride the lack of furniture—no chair the president sat in, or bureau he used. Such personal artifacts, she said, would only distract visitors from pondering the sublime greatness of the president’s achievements. Absence creates a space in which the past can be fully contemplated. Actually presence is likelier to prompt contemplation. Meaning matters; things that are real and tangible are moving. A single bullet dug from the ground of Gettysburg can tell you as much about what that battle was, the sheer bloody horror of it, as a chapter of a book. People know this naturally, which is why Gettysburg years ago had to stop people from digging around. They were tearing the place apart. Physical reality is crucial in understanding history. The bullet says the battle was real. The street-level World Trade Center memorial site—the gleaming buildings and reflective pools—seems to me part of the modern trend. There are no heroic statues, nothing to tell us what the firemen did. In the imagination of curators and historical custodians the Higher Blankness gives us space in which to contemplate meaning. Instead we see emptiness and it feels . . . empty, bled of import. But below ground the new museum is a masterpiece of particularity. Everything in it says the real and physical does matter, and what happened on that day—the facts of it, the meaning of it, who did what and how, who survived and died—matters. 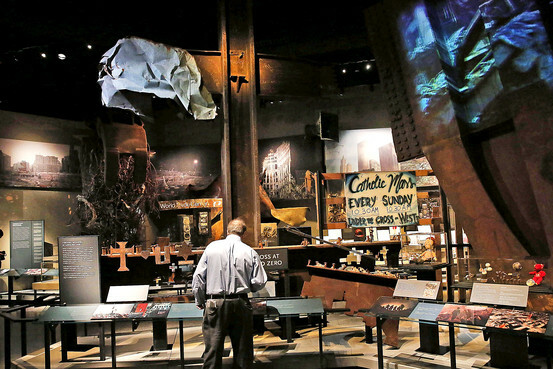 Artifacts in the National September 11 Memorial Museum in New York. It is a true history of the day and its aftermath. You see the ruined firetruck from Ladder Company 3. The helmet of a fireman. The red bandanna that Welles Crowther, a young equities trader, wore when he lost his life saving others in the south tower. There are things picked from the debris like bullets from the field at Gettysburg: a woman’s purse, her eyeglasses, the shoes a man wore as he fled the collapse. The early reports on TV, the “missing” posters, Mass cards. The cross at Ground Zero, the votive candles, the tridents, the slurry wall, the survivors’ staircase, which people in the buildings walked down to safety. And the posters and poems and banners and flags and funeral cards that were suddenly all over the city as New York, in the days and weeks after, began to come back. What a relief to see history treated as something with meaning. Because the museum does not dodge reality but shows you what really happened, you wind up reflective. Contemplative in a way that blankness does not engender. All of it is presented coherently, sensitively, intelligently—nothing vulgar or sentimental, nothing exploitative. The space itself is massive, which underscores the brute massiveness of the event. The lighting is intensely targeted but not harsh, just bright where it needs to be. Someone did beautiful sound design—turn this corner and you hear the EMT operators trying to deal with a flood of unbelievable data, turn that corner and it’s the wailing bagpipes at a fireman’s funeral. It is all just so real, and done with such exquisite respect for the human beings who were there, and wound up that day enmeshed in history. The memorial and museum cost about $700 million combined. A press officer notes the nonprofit foundation that oversees both does not receive city, state or federal funding. The admission price is high, $24 for adults. I mentioned this to a press representative who later noted that family members of those who died, and the families of rescue and recovery workers, are admitted free, and there are free hours for the public Tuesdays from 5 to 8 p.m. There has been a controversy about the gift shop, which is said to be cheesy, and undignified. The criticism was led by local politicians who didn’t like the T-shirts and jewelry, the NYPD dog vests and little bronze earrings. I always sit up and listen when New York City pols call something crass, because they’d know, right? But is the criticism fair? The Oklahoma City Memorial Museum, the Holocaust Museum, Gettysburg and other sites also have gift shops that sell trinkets and books. All are meant to support maintenance and operations, which at the 9/11 site will cost an estimated $60 million a year. Gift shops also exist because people want something to remind them of the day and what they saw. When they buy something with “9/11” on it, they are remembering it, and asking you to remember too. And cheesiness is in the eye of the beholder. When I was 10 or so I went to a historical museum and the gift shop sold cheap renderings of the Declaration of Independence and the Emancipation Proclamation. I bought them and taped them all over my room. I’d have bought Independence Hall earrings too if I could. Kids like things that remind them of something important. So do grown-ups. Although I suppose we’re all supposed to think big abstract thoughts and never indulge our need for the tangible, for something you can hold in your hand. I’m sorry, but stop. You’re in the middle of a masterpiece. The shop helps pay the bills. Leave it alone. We’re all so used to being disappointed at 9/11-related memorials that we think criticism must be the only legitimate response. At this point it’s a reflex. But the creators of the 9/11 museum should be deeply proud. Finally someone has created something worthy of the day.